Lemon, gooseberry and elderflower – even the words taste good. I can almost smell the dusty elderflower pollen, feel the bur of the gooseberries, and taste the lively citrus of lemon oil. 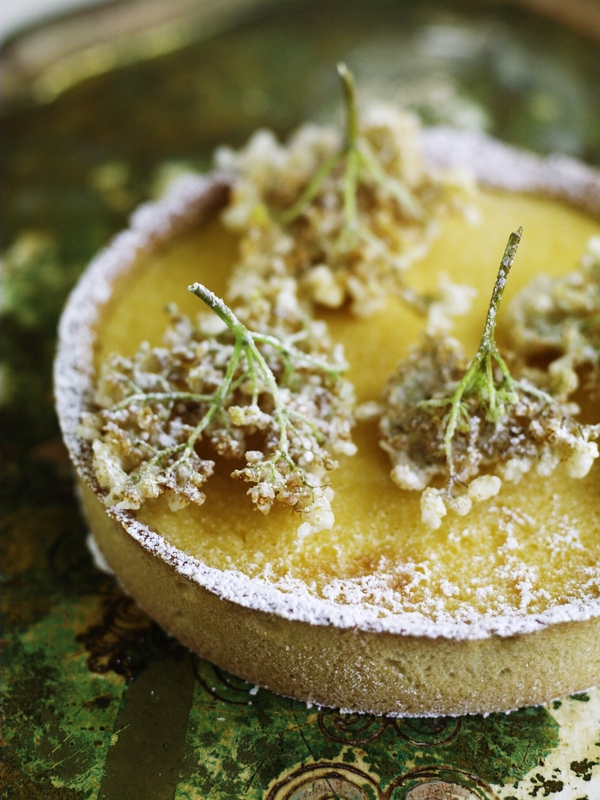 I’ve made loads of different lemon tarts over the years, but none quite as simple as this one. Recipe from Gather. Quadrille publishing. Heat your oven to 180°C/350°F/gas mark 4. Grease and flour an 18–20cm/7–8in tart tin. Lay the rolled pastry over the tart case, tucking it down into the corners (you’ll have a little overhang). Refrigerate for 15–20 minutes, then remove from the fridge and line the case with baking parchment and baking beans. Place in the oven for 20 minutes, then take out the beans and parchment and blind bake the case for a further 10–15 minutes, until crisp and golden. Remove from the oven and trim around the edge to neaten. lemon juice and zest, egg yolks and sugar. Whisk to combine. Place the bowl over a pan of barely simmering water. Stir continuously and when the mixture has thickened and is hot, drop in the butter, a few cubes at a time, stirring to encourage it to melt. When you’ve incorporated all the butter, cook for 2–3 minutes, stir, then remove the bowl from the pan. Turn off the heat. Strain the curd through a sieve into a large bowl, then pour it into the tart case. Refrigerate for 6–8 hours, until set. 3 tablespoons of water, and whisk until smooth. Fill a medium saucepan 5cm (2in) deep with sunflower oil. Place the oil over a high heat, then drip in a few drops of batter – if they fizz the oil is frying-hot. Dip the elderflower heads into the batter, shake them, then lower them one at a time into the oil. Fry each for 1 minute, or until crisp. Dust the fritters with caster sugar and serve on top of the tart, with a final dusting of icing sugar, if you wish.